Buying a wireless digital Meat thermometer can be a tad bit overwhelming. Between the many different brands, options, manufacturer claims and price points, it’s enough to make you want to give up and continue guesstimating the doneness of your meat. Don’t give up. My goal here is to help you figure out the best model for your needs, cooking style and budget. 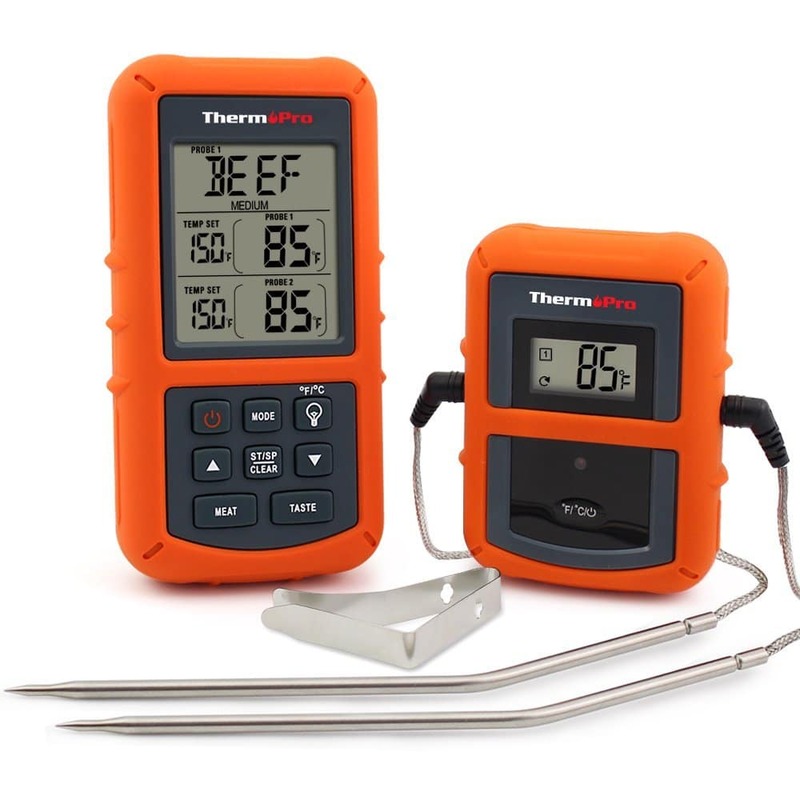 While digital thermometers aren’t new, wireless digital meat thermometers are quickly becoming the go-to temperature gauge for the casual backyard warriors, serious grillers and pit masters alike. 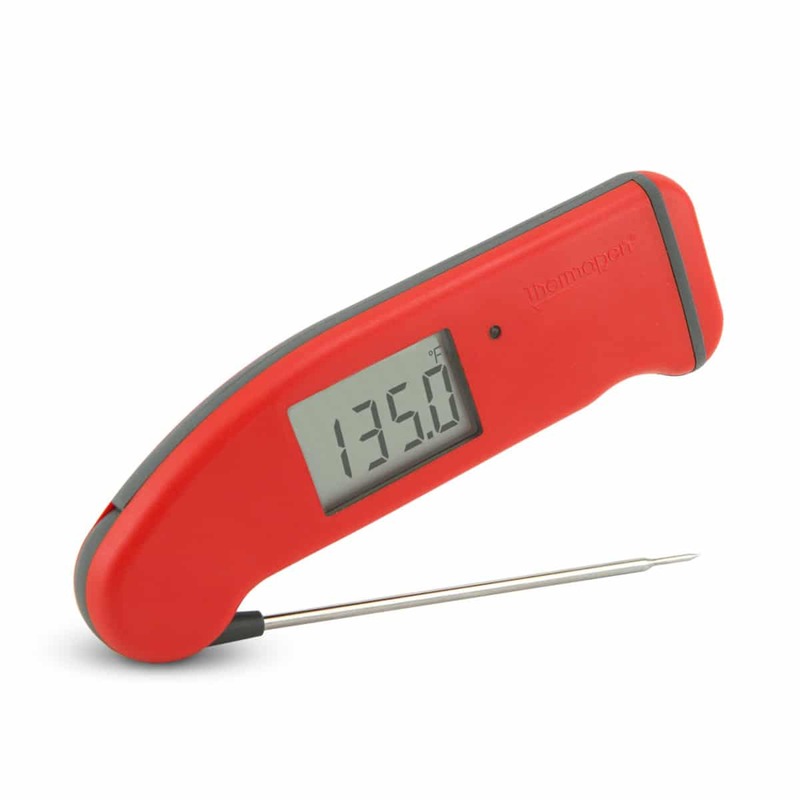 The digital and wireless aspects make these thermometers easier to read and more convenient than their analog counterparts, which takes some of the strain and stress off you as the cook. 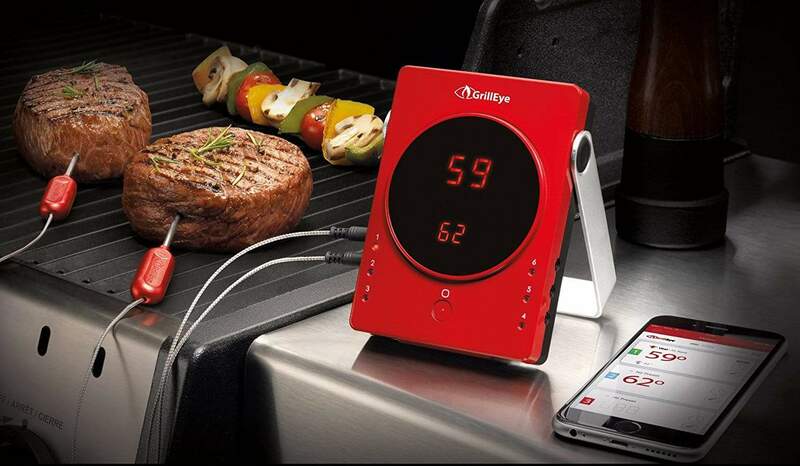 With a wireless thermometer, you don’t have to remain tethered to the grill, smoker, or stove anymore. Better still, even though many digital wireless thermometers are advertised for grilling and smoking, the majority of them are versatile. This means they can be used for cooking and baking in the kitchen, candy making, brewing and anything else that needs accurate temperature monitoring. It’s always smarter to pick a utensil that can serve you well in other areas of your culinary endeavors. For all of that, the question becomes, how do you go about choosing the right wireless thermometer? Which one is best? More to the point, which one is best for you? Why Buy A Wireless Digital Meat Thermometer? The first, and most obvious reason to buy a wireless digital thermometer is because you never mess around with meat. From E. coli to salmonella, uncooked and under-cooked meats pose too many health risks. Secondly, it would hardly do to spend your hard-earned money on a beautiful piece of protein, only to overcook it. You know the heartbreak of pulling a chewy, dried out piece of leather off the grill or out of the smoker. It happens in the oven and on the stovetop, too. 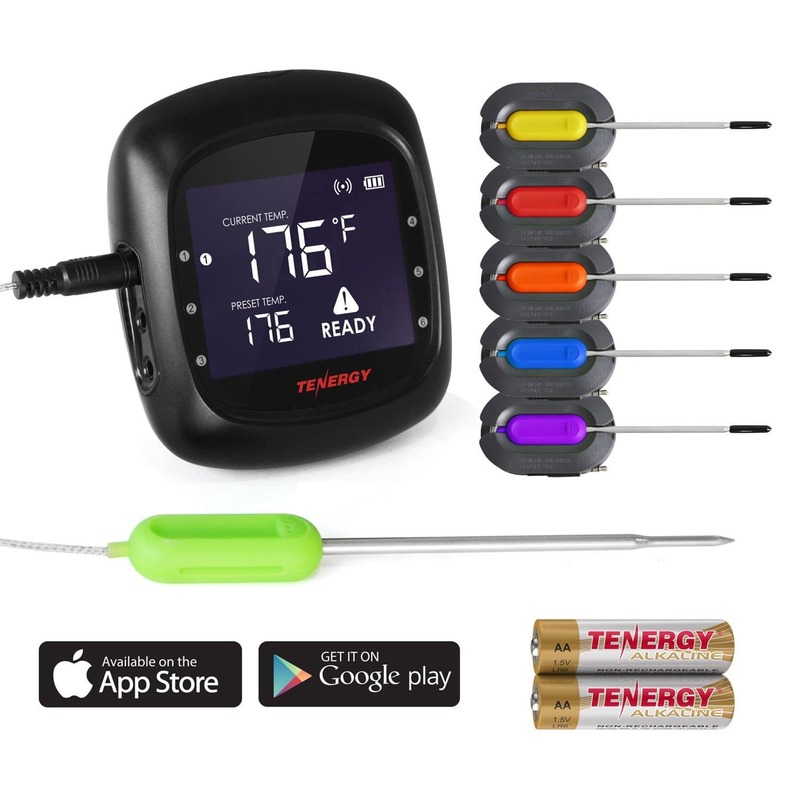 Even if you limit your cooking to the kitchen, you need an accurate thermometer that lets you know when your steaks are rare, when the turkey is fully cooked, and when the roast is ready to fall off the bone. Although many digital meat thermometers market themselves as professional tools, you don’t have to be a pro chef to use them. You don’t have to be a grill master, nor do you have to participate in smoking competitions. You can, of course—competitive cooking depends on perfect temperatures—but the point is that even casual outdoor cooks benefit from a quality temperature gauge. As a home cook, in fact, it’s even more important to guarantee that you’re serving healthy, safely cooked proteins to your family. And a sure fire way to get a safely cooked, tender and juicy, perfectly prepared piece of meat is by knowing the exact temperature of your cooker AND the exact internal temperature of your food in order to create awesome mouthwatering results. While the ultimate purpose of both wireless and instant read thermometers is to get accurate temperature readings, their uses are slightly different. An instant read thermometer is great for a fast, in and out reading during a cook and even better for verifying your final results. But what if you don’t want to let all the heat and flavor inducing smoke out of your cooker every time you open the lid to check the temperature? And suppose you want to monitor the internal temperature of your cooker along the way, allowing you to perfectly maintain the ideal heat “sweet spot” during your cook? That’s where a wireless “leave in” digital thermometer comes into play. Here is a quick break down of the advantages and limitations of both. Instant read thermometers have a sharp probe on one end and a digital temperature readout on the other end. You poke the sharp probe into your meat, always avoiding the bone, and the temperature shows up on the digital display within a few seconds. A good instant read thermometer will almost always be faster, more accurate and simpler to use than a leave in probe thermometer. They will usually have a larger range of temperatures they can read as well. They can provide you with the temperature of your food in as little as two seconds with an accuracy as close as ±0.7°F of the precise temperature. They are usually ready to use straight out of the box without the need for instructions and work better for thinner cuts of meat. They are your absolute best bet for confirming the foods final temperatures and can easily be used to check temperatures at multiple spots in your meat quickly and efficiently. They are compact, can fit in your shirt pocket and can easily be stored when not in use. 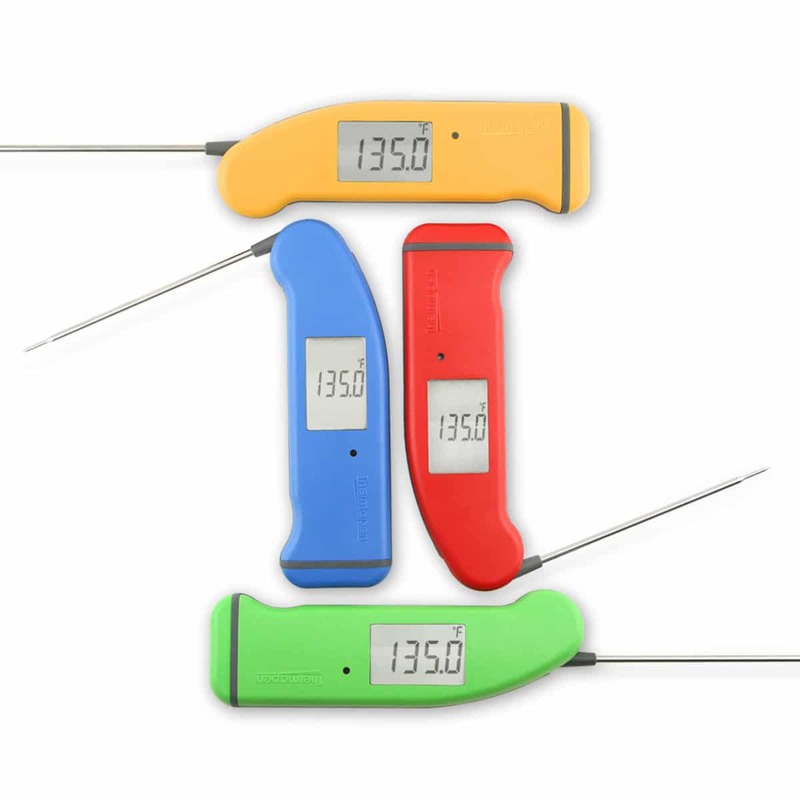 Instant read thermometers are the true definition of user friendly and you will never see a professional chef or BBQ pitmaster without one. The downside is that they cannot remain in the meat during cooking and you can’t use them to check the internal temperature of your grill or oven. You will have to let precious heat and smoke escape every time you open the lid to check your foods temp and you will have to check on your food more frequently. They often require you to reach into a hot grill or oven to check your food, which can cause accidental burns and make for awkward reading angles. You won’t be able to monitor your food remotely. They are excellent for quick and accurate spot checking and verifying final readings. In many ways, they are a cook’s best friend and extremely handy to have around. If you prefer to hover over the grill, an instant read thermometer is a good choice. Digital wireless meat thermometers with wired probes make this process even simpler. A digital wireless thermometer consists of a probe and an electronic monitoring base unit, which attach to each other with a long heat-proof cable. The probes can stay in the oven or the grill as your food cooks, without you having to open the lid of your grill. Being wireless just adds to that convenience. 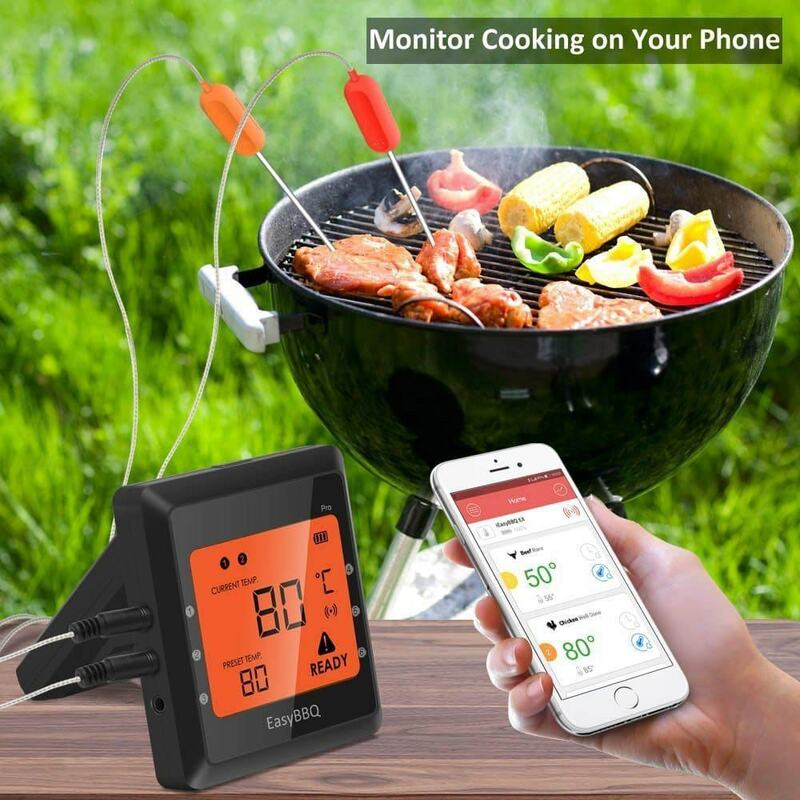 Using either Bluetooth technology or radio frequency transmission, these thermometers allow you to monitor your food using a wireless receiver that comes with the unit or your smartphone even if you’re not right by the grill or smoker. You can be upstairs while the brisket cooks downstairs and still monitor your meat. Wireless probe thermometers also pack on the features. 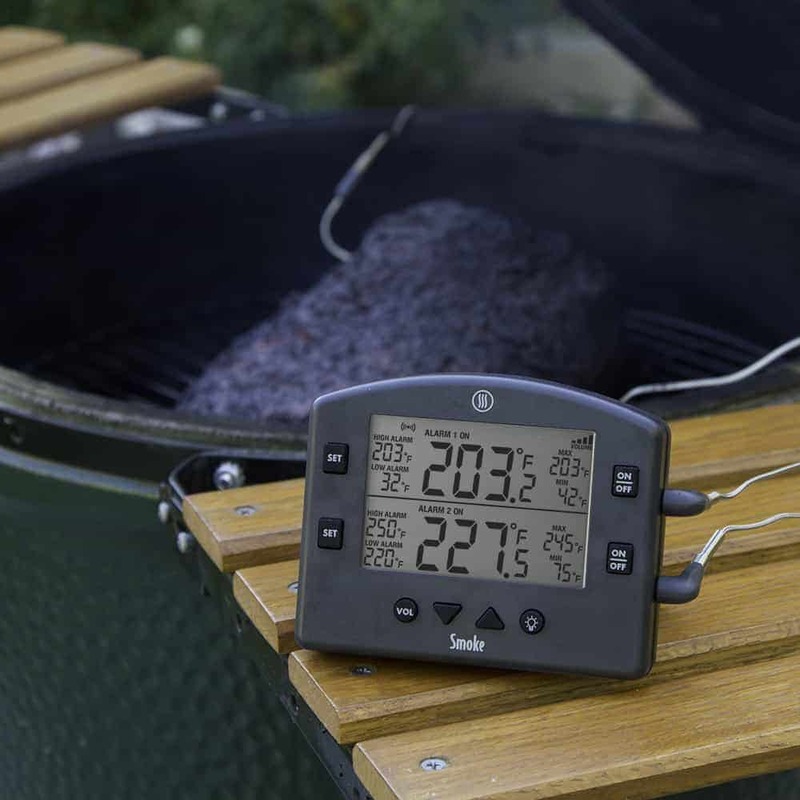 These features could include preset temperature settings, high and low temperature audible alerts, auto off features, remote monitoring, timers and the ability to keep track of both the temps of the food and grill simultaneously. While they are still quite accurate, they can’t match an instant read thermometer for accuracy. They are not the best choice for a quick check of the temperature of your food either, as they are not instant reading. The probe wires could be damaged if not handled correctly and replacements could start to add up. They are excellent for low, slow, long cooks for monitoring both your food and the cooker every step of the way. They are essential for big meats like turkeys, roasts, hams, pork shoulder, brisket, and tri-tip. If you like to roam while cooking, visit with family and friends or multi-task on side dishes, go for a wireless probe thermometer that remotely alerts you when your food hits the desired temperature. Because wireless digital thermometers are becoming more common, it’s critical to pay attention to the details of each thermometer and comparison shop before you make a final pick. It’s surprisingly easy to find a unit that hits on all or most of the essential points. So, if you come across a thermometer that doesn’t possess a needed or desired trait, move onto the next one. Accuracy is the most vital aspect of a wireless digital meat thermometer. Again, you don’t mess around with meat. Under-cooked food is never worth the risk. Look for a wireless thermometer that promises accuracy to within one degree, no more than two. Avoid any thermometer with an accuracy that decreases appreciably with high temperatures. We are all aware of what could happen if we eat undercooked meat, but eating an overcooked piece of expensive meat isn’t much fun either. While speed obviously isn’t as important for a leave-in thermometer, a good one will still have a read refresh time of around 15-20 seconds giving you have a good idea of what’s going on in the grill or oven. Don’t mess around with a thermometer that can’t reach a high temperature. If you frequently cook at 400°F, then a thermometer that can only withstand 350°F is worthless to you. Look for units that can handle 500°F or higher even if you’ve never cooked to such a high degree in your life. Better to have it and not need it than to need it and not have it. The wider the range a thermometer can accurately handle, the more useful and versatile it is. Nothing about the thermometer you choose should be hard to see or to use. It should be as intuitive as possible as nothing is worse than having to fiddle with the thermometers controls at a critical moment. The screen should have a large and clear display. A backlit display is important too so you can see the readouts on the unit no matter the lighting conditions. The controls should be large and easy to read and understand, as well. Believe it or not, the best thermometers only have a few buttons. There’s no need for more than that for models that work with an app, anyway. No matter how smart these thermometers get, they are still only as good as our ability to easily control them. A digital thermometer with a backlit screen makes them easier to read in low light conditions like grilling in the evenings, or overcast days. Wireless thermometers use batteries. It helps to look for something with a rechargeable lithium battery because it saves money over time but not all models allow them. Whether it uses lithium or traditional batteries, look a model that comes with automatic shut-off that turns itself off after a set amount of inactivity. I can’t tell you how many times I have forgotten to turn a thermometer off after cooking because I was so intent on eating. Auto shutoff is a lifesaver for battery life. 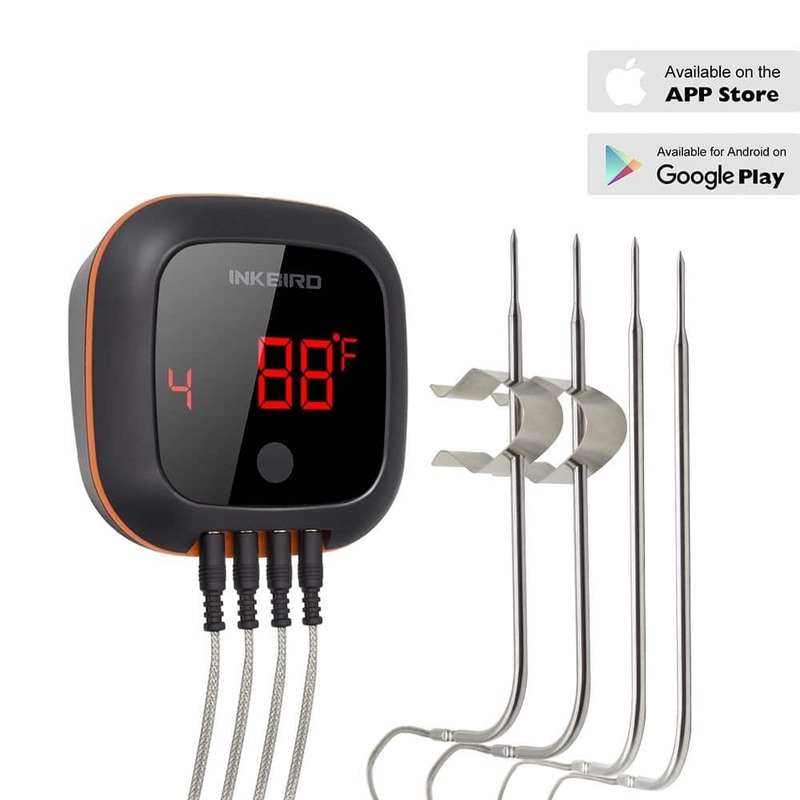 Audible alerts that let you know when your meat has reached the preset temperature or the temperature inside your grill or smoker is getting too low or high is a must for a wireless thermometer. What’s the use of being free to concentrate on other tasks if you still have to manually check on things frequently? Many of the best models come with a wide range of preset temperatures for every type of protein and doneness level. These presets allow you to select a preprogrammed temperature for a quick set up and are based on USDA-recommended temperatures. If the preset temps are not to your liking and you really want full control of your outcome, then look for a wireless probe thermometer that allows you to customize and save your programmable temperature settings to your desired specifications. This is something I personally use for most cooks myself and the ability to save your changes is huge. A built in timer is more of a like to have than a need to have and is actually built into many models anyways. Being able to set a countdown or count up timer could be very useful in many circumstances. This is one of those options that will appeal to some a lot more than others. I personally almost never use the built in timer option as I am used to using my phone as my timer. But it makes a lot of sense to only have to use one device instead of two. It ultimately comes down to your personal preference. A unit made from heavy duty plastics with good quality materials go a long way in increasing the overall lifespan of the unit. You need a thermometer with durable probes, preferably antibacterial. Look for probes and probe cables that can withstand high heat temperatures of at least 500 degrees Fahrenheit or more. If you can find cables that are at least splash proof, you will be doing yourself a big favor. The benefits far outweigh the disadvantages, making a wireless digital meat thermometer an ideal choice for anyone who enjoys cooking, especially larger meats. The convenience is well worth the money in my humble opinion. 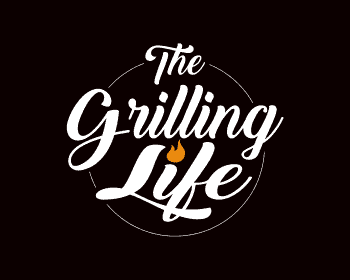 Knowing what’s going on under the hood of your grill or smoker at all times just makes so much sense if you’re really looking to produce the best outcome. If you want the peace of mind of food safety and a flavorful meal your family will thank you for, wireless thermometers will help you every step of the way. Owning one is a no-brainer if you ask me. Now that you know the advantages of owning a wireless digital meat thermometer, and what to look for in choosing the best product for you, it’s time to start researching different models. Better yet, let me do all the hard work for you. 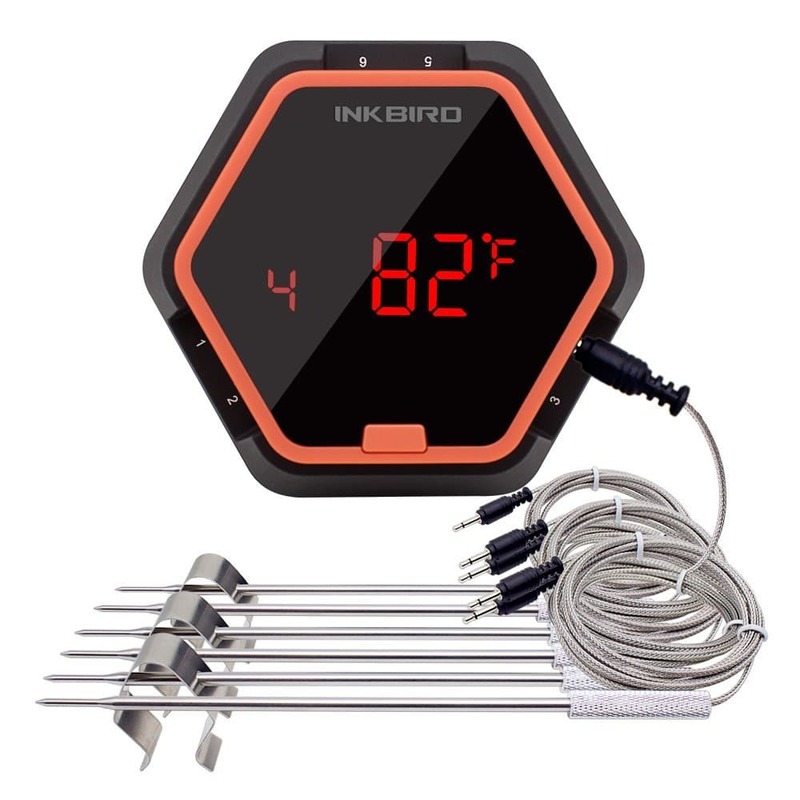 I have researched and tested over 30 remote digital thermometers and put together a list of the best of the best to help you choose the perfect wireless grilling thermometer to fit your budget and needs. You can read my top choices by clicking on the button below. As always, if you or someone you know is in the market for a wireless digital meat thermometer or you find this information useful, please consider sharing it with your Grilling friends and on social media! If you would like to leave a comment or have tips of your own to share on choosing wireless digital thermometers, please do so below. We always welcome your input.